Remember your first experience on a Ferris wheel? They have been creating memories for all ages around the world and remain popular for several reasons. Some passengers ride for the unparalleled views and the thrill of being high above, while others prefer the wind in their face while going around and around on a wheel. In 2014, I wrote an editorial in Destinations Travel Magazine titled Worlds Best Ferris Wheels with Scenic Views. The London Eye was featured in my article, but at that time I had only researched the observation wheel. I am happy to say, 7 months later I had the opportunity to ride the London Eye myself!! How did it all begin? The Ferris wheel is named after George Washington Gale Ferris, Jr., who designed the first wheel for the 1893 World’s Columbian Exposition in Chicago standing at 264 feet tall. The Ferris wheel is usually the first object that catches your eye when approaching a carnival, fairgrounds or amusement park due to its height. Ferris wheels may be referred to as observation wheels, big wheels or giant wheels, which are basically one in the same. The term “observation wheel” refers to the phenomenal, panoramic views which can be seen while riding the wheel. The Ferris wheel turns at a fairly slow speed to allow passengers the ability to get on and off at the bottom, take in the view and snap pictures while riding. The modern observation wheels tend to be much larger and more sophisticated than Ferris wheels. Ferris wheels usually include the classic, two passenger, open air seating while most observation wheels offer enclosed, air conditioned seating for groups called capsules or pods. The picture below provides a sneak peak inside the capsule with hardly anyone in it- besides my mom! December is a great time to tour Europe as most people are no longer on holiday. We pretty much had the capsule to ourselves! The London Eye stands at 443 feet tall and is located in the heart of London on the South Bank of the River Thames. Since the opening in 2000, the wheel has had several names to include British Airways London Eye, Merlin Entertainments London Eye and the Energy London Eye. Also known as the Millennium Wheel, it is the tallest in all of Europe attracting 3.5 million people annually. Take a 30 minute ride with panoramic views of the London skyline highlighting the Palace of Westminster, Charing Cross railway station centre, Waterloo railway station and Big Ben. On a clear day, you can see as far as the Windsor Castle. The London Eye has 32 capsules which hold 25 passengers each. Interested in reserving a private capsule? The London Eye offers an array of options, choose from the Champagne Tasting Capsule, Hotel Chocolat Capsule, Cupid’s Capsule, Wine Tasting Capsule, Children’s Birthday Party Capsule or create your own! Ferris wheels are a great way to view cities from high above. They are fun for all ages and just keep getting bigger and better. On Labor Day Weekend 2016 The New York Wheel on Staten Island is expected to open at a height of 630 feet! In 2013, Dubai announced plans to construct The Dubai Eye, inspired by the London Eye, expected to reach 689 feet on the new Bluewaters Island. Get ready, we’re going up! When visiting London, there were several sites that I wanted to venture out to. Windsor Castle, Stonehenge, and the town of Bath to name a few. We visited in December, which is very cold, rainy and cloudy, reflective in the pictures. Bath is where I first sampled the true form of cider. Do not make the mistake I did, thinking it was the American version of hot, apple cider. It looks and smells just like the American version of spiced apple cider. The United Kingdom has the world’s highest per capita consumption of cider. The most notable difference between American cider and European cider is the alcohol content! In the UK the law states that cider must contain 35% apple juice whereas in the U.S. it must be 50% apple juice and in France, the cider is solely made from apples. The cider in Bath will knock your socks off, but anything hot was wonderful in December. A warm beverage is a fantastic addition to the Christmas caroling in the streets. The cider in Bath is served from a big copper pot, continually stirred. Perry cider, made from pears, is quite common in England as well. I would recommend grabbing a hot cup of cider AFTER touring the Roman Baths, just speaking from experience. The town of Bath, pronounced both as in moth, is located 97 miles west of London in the county of Somerset, England. The town is well-known for Roman-built baths in 60 A.D., which were created from bath stone and feature four areas: the Sacred Spring, Roman Temple, Roman Bath House and the Museum. Over 1 million tourists per year stay in the town of Bath to visit the baths and the Grand Pump Room. 3.8 million visitors come for the day per year. Visitors are prohibited from entering the waters as they are considered unsafe for bathing. The waters pass through the original lead pipes. Bath stone has a warm, honey color and is easy to cut, square and shape without crumbling. It is interesting that the Roman Baths are actually situated below street level. The buildings above street level are from the 19th century. Bath has their own sports team called Team Bath. It is fascinating to view what the engineering was like 2000 years ago. This is a picture of the water system at the Roman Baths, which were naturally heated by use of warm water from the local springs that would enter through the water system. The Romans were able to design complex plumbing systems to provide hot water to run into their baths. Where does the water come from? The water comes from the rain in the Mendip Hills and then bubbles up from the ground at Bath Falls. The water then filters through the limestone between 2,700 and 4,300 meters, causing the water temperature to rise between 69 and 96 °C. The pressure forces the heated water to rise to the surface. In the picture above, you are able to see a portion of Bath Abbey, also know as the Abbey Church of Saint Peter and Saint Paul, which is visible from all over the town. Bath Abbey was founded in the 7th century and rebuilt in the 12th & 16th centuries as one of the largest perpendicular structures in Southern Western England, seating 1200. While the abbey is a major tourist attraction, it is also an active church, concert & lecture hall inclusive of hundreds of members. At the outdoor market, vendors sold locally made items for tourist to browse. Christmas is a wonderfully festive time to visit Bath. Jane Austen lived in the town of Bath in the early 19th century. The Roman Baths were featured in 2005 on the program Seven Natural Wonders as one of the wonders of the West Country. Bathing in Rome was considered a communal activity, not private as it is practiced in the United States. If visiting Bath for the day, it is best to book a tour from your hotel. If you are not staying in a hotel, than you can still book a tour and can be picked up at a hotel in town. We booked a tour and the pick up location was the Sheraton Park Lane Hotel. Our tour had several stops which was a 12 hour day. Shop around, compare prices and decide what you want to see in the span of a day. We loved the convenience of being able to have a couple of drinks and not have to worry about driving, getting lost or viewing maps. In addition, the tour guide was extremely knowledgable providing historical facts along the way. It is about a 2 hour ride from London each direction. We chose a tour that included wine (of course) and lunch. Many of the tours allow free time as well, so not to feel smothered or restricted. Be sure to inquire where the drop off location is. We assumed that it was the same as the pick up and after a very long day, we discovered we were on our own for a cab ride back to our hotel from downtown London. I love the picture above which shows one of the confectionery display cases. It’s as if you’ve stepped into a movie, complete with staff in uniform and hats, bright and cheery smiles, and the ceiling laced with light fixtures every 12 inches. The cases, shiny and absent of fingerprints, simply go on and on for what seems like miles to include the finest of chocolates from all over the world. It is not just chocolates in the confectionery case, you will find an assortment of nuts, chews, Turkish delights, truffles, caramels, brittles, bars, mints, chocolate covered coffee beans, gold foiled coins, biscuits & fruits, pralines, alcohol-free selections, florentines, toffees, candied fruits, and hand-crafted selections just to name a few. It gives a whole new meaning to a kid in a candy store. Everything is exciting. Even when I saw something that was familiar, the packing was unique or the colors and flavors were original. Keep in mind, this is just the sweets section of Harrods. Harrods is located on Brompton Road in Knightsbridge in London. Harrods is difficult to describe as there isn’t anything else in the world that compares to the 5 acre, 1 million square foot store with 300 departments within. Harrods was founded in 1834 by Charles Henry Harrod, it is the largest department store in Europe and the third largest in the world. While Harrods may not be the largest store, it is by far the most spectacular, displaying the finest products from around the world. Picture yourself walking around for hours and not fully experiencing the entire store. I found Harrods to be absolutely fascinating for several reasons, one of which is their dress code which was implemented in 1989. How many stores have a dress code? It is common for fine restaurants to require a jacket and tie, but this was the first I had heard of a department store requiring specific dress, not to be confused with their “afternoon tea dress code”. The first time I had been to Morton’s Steakhouse, my husband and I were young and not aware that suit jackets were required. Fortunately, they had a closet full of jackets for people like ourselves. To be a patron of Harrods, you may not wear ripped jeans, high cut Bermuda or beach shorts, swim wear, cycling shorts, spandex, flip flops or thong sandals, dirty or unkempt clothing, bare feet, radical hairstyles or exposed midriffs. While growing up, my grandmother told stories of when she was a little girl and wore gloves and a hat to shop at the departments stores in San Francisco and when boarding a flight. Harrods is so much more than a luxury department store, inclusive of 32 restaurants, a personal shopping-assistance program known as “By Appointment”, a watch repair service, tailoring, pharmacy, beauty salon and barber shop, Harrods Financial Services, Harrods Bank, Ella Jade Bathroom Planning and Design Service, private events planning and catering, food delivery, wine steward, fragrance formulations, and arcade machines. Coffee: For all the coffee connoisseurs out there, Harrods sells the most expensive coffee & teas in the world! What are luxury coffees? For starters, the beans are hand selected. The coffee is scarce and has very low production. Terra Nera is the rarest coffee in the world sold exclusively at Harrods. It is sourced from Quechua (Peruvian Andes) due to the altitude. The coffee beans come from coffee berries fermented through a cat’s digestive tract, creating a fragrant, flavorful bean with hints of cocoa, hazelnut, buttery body with a velvet finish. Six different grades of coffee are available. Grade 0 is the finest of all the beans which are hand-selected. If you’re asking, what do I get when ordering the Grade 0 coffee? The Grade 0 coffee is sold in a 24-carat gold-plated sack. Harrods has arranged for each sack to be individually engraved and hand-crafted with the customer’s name by renowned and award-winning silversmith, Rebecca H. Joselyn. The customers who place orders exceeding 500g will be offered a complimentary coffee machine. Prices for Terra Nera coffee range from £140 to £6,800. When it comes to shopping, I love luggage. Maybe is has something to do with my passion for travel or the ability to spot my bag as it comes down the belt at the airport? I don’t necessarily have the need to “travel in style”, but I know that I am fascinated by great, durable bags. With that said, I also am realistic in that there are very few items in which I can afford at Harrods, luggage being one of them. However, I still love to look. I took a couple of photos of luggage and texted them to my daughter as she shares the love of luggage. Did you know that Harrods has stores in two airports? Harrods is located inside Heathrow and Gatwick. Harrods luggage selection is broken down into four categories: Alpha Collection, Alpha 2, Arrive Collection, and Tegra-Lite. Harrods even has a section called Children’s Travel. What does all this mean? It is overwhelming in the sense that there are over 20 brands of luggage at the department store. A few of the brands which may sound familiar are Samsonite, Lulu Guinness, Mulberry, Kelsey and Burberry. The imagine to the left is the Ted Baker line, notice the print on the outside continues into the lining of the luggage. The luggage is also available in light pink starting at £275.00 ($391) for the small size. Dining at Harrods is an experience in itself, offering 10 classic restaurants, 12 contemporary options and 6 cafes. When dining at the Rotisserie, be sure to try the Harrods 1849 Lager. After a cold, blistery day in December, we ducked into Harrods for hot, succulent, free-range chicken, roasted over a flame. Sit up to the bar and watch the chefs cook your dinner and saute with flames, while listening to the clanking of pans, laughter, International aromas and languages fill the air. The décor at the Rotisserie dates back to the turn of the century. Try one of the specialty kebabs and side dishes such as roast potatoes and gratin dauphinois (potatoes and crème fraîche). 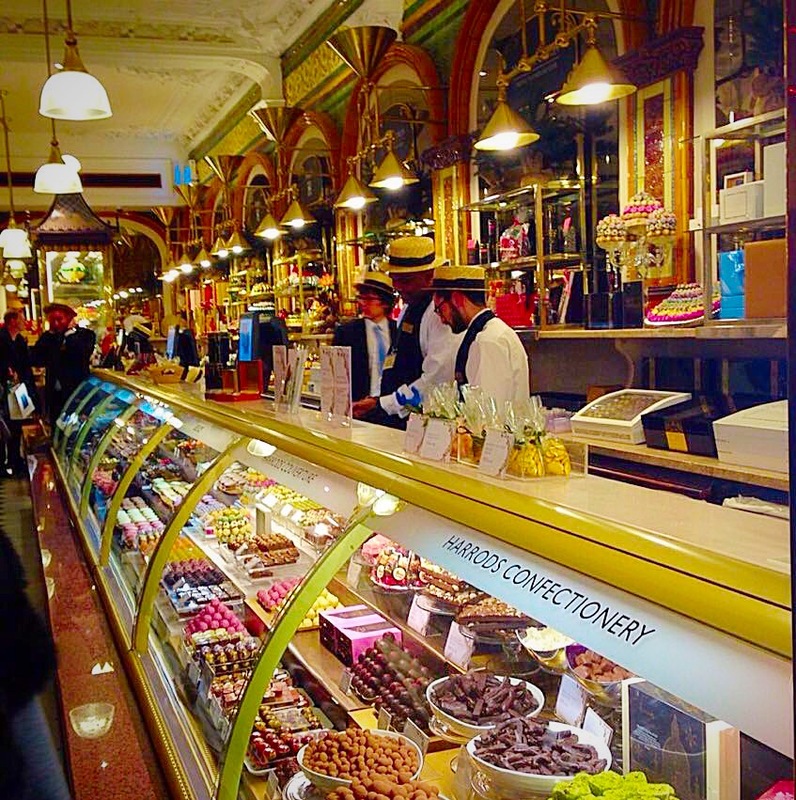 Harrods restaurants are categorized by Classic, Contemporary and Cafe. There are 26 restaurants including some familiar companies such as Cafe Godiva, Disney’s Wild West Cafe by Harrods, and Bentley’s Sea Grill. I love that Harrods is not super fancy, you can bring children and dine someplace fun. It is a great place to pop in and just have dessert or hot tea. This blog post would never end if I attempted to describe everything in the store but there are certain things that caught my eye. I thought of my daughter who absolutely LOVES ice cream, when I passed by the Ice Cream Parlour. The most interesting part of touring Harrods were the two memorials of Princess Diana and Dodi Fayed. The first one, a picture of the two behind a pyramid display along with a wine glass with Diana’s lipstick from her last dinner which was unveiled in 1998 and is located at the base of the Egyptian Escalator. The second memorial is located at the escalator by the door titled “Innocent Victims”. It is the first time I have seen a memorial in a department store. The bronze statues show the couple dancing on the beach under an albatross. The statues were unveiled in 2005 and are very peaceful and beautifully designed by William Mitchell, who was a close friend of Mohammed Al-Fayed, Egyptian multi-millionaire and the father of Dodi Fayed. In 2010, Al-Fayed sold Harrods to Qatar Investment Authority for £1.5 billion. Just when you think it can’t get any better….visit Harrods during the holidays. Magical, like you’ve never seen before. The display windows are out of this world. Bright with color, music playing, gowns made of jewels, snow falling and the displays move. Absolutely spectacular! We rode in the taxi cab with the windows down in December (freezing) just so we could hear the music playing in the display windows. Parents with children, couples holding hands and people passing by, stop to look into the windows on a cold, dark evening pointing with excitement and speaking in various languages. In 1898, Harrods debuted England’s first “moving staircase”, known today as an escalator. Harrods is the only department store in Britain that has continued to sell furs. Female employees are required to wear six kinds of makeup at all times. Harrods has been connected with several high profile crimes over the years, including the 2012 theft of a £24,000 designer dress. A memorial statue of Michael Jackson was unveiled in April 2011 at the rear of Craven Cottage football ground and then removed in September 2013 on the orders of Shahid Khan. Dinner of a lifetime at Harrods!! 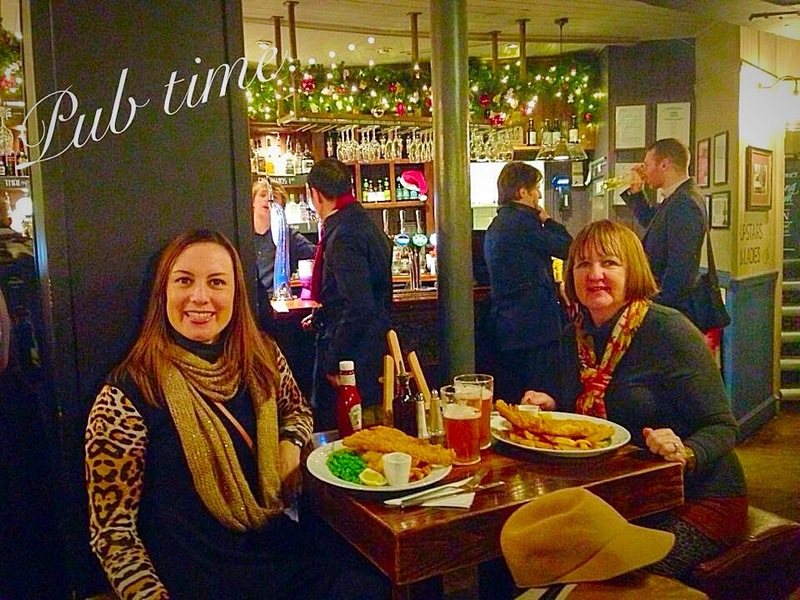 On a freezing cold, wet and breezy December day in London, nothing is better than ducking inside a local pub for hot fish & chips! When planning my trip to London, there were two recommendations that I received time and time again. 1- Attend live theater because it is the best in the world! What is the history behind smashed peas? Mushy peas are part of traditional British cuisine, made up of dried marrowfat peas. These peas are pre-soaked overnight in water along with baking soda, rinsed and then simmered with a little sugar and salt to create a thick, green, lumpy soup. They are often served with fish & chips in Northern England and the Midlands. In Northern England, you may see mushy peas on the menu as an entrée called Pie & Peas. Fish & Chips have been one of Britain’s favorite dishes since the 1860’s. The Glassblower is located between Regent Street & Piccadilly Circus at 40 to 42 Glasshouse Street, which is walking distance from the Le Meridien Piccadilly where we stayed. The pub was originally a Victorian workhouse. Earning its name, The Glassblower was a place where workers spent their day blowing glass. I always pictured a brew pub in Europe as a noisy establishment located on a busy street corner with dim lighting, dark wooden floors, bar stools, tables crowded together, lively atmosphere, men in coats and scarves, a long oak bar with several brews on tap and people crowding all around trying to order. Well guess what? It was exactly as I pictured! Upon approaching the pub, we could hear all the loud voices each time the front door opened. There’s something to be said for a brew pub in the winter. Looking around, I took note of the coat racks and everyone who walked in. I observed as they took off their jacket and scarf and hung it on the rack. The cold temperatures could be felt from the windows as we sat inside. The smell of hot fish & chips filled the air each time the waitress passed the table. You’ll hear the sounds of clanking dishes, constant chatter in various languages, and a lot of cheering. Waitresses were making their way up and down a narrow staircase, which led to a smaller bar area. The Glassblower appears much larger on the outside than it truly is on the inside. Are all pubs located on a corner? There is a story behind that. Landowners in London controlled large pieces of land which were available to developers via leasehold. Before the developments began construction, pubs were built to feed the workers. The corner location allowed the pub to stand out on a block of businesses. It’s also more convenient to be dropped off on a corner than in the middle of a street. After completion of the developments, the pubs remained on the corner and became a point of social focus. Some developers were not thrilled with pubs in their area so they offered them large amounts of cash to move out. The menu includes traditional British entrées such as Lamb & Sweet Potato Pie, Pastrami Burger, Chicken & Chorizo Burger, Ploughman’s Tart, Sausage & mash, and Chicken Chardonnay Pancetta Pie! The Ultimate Fish & Chips are hand-battered cod fillets served with your choice of mushy or garden peas, pickled onions, bread & butter, curry sauce and tartar sauce. 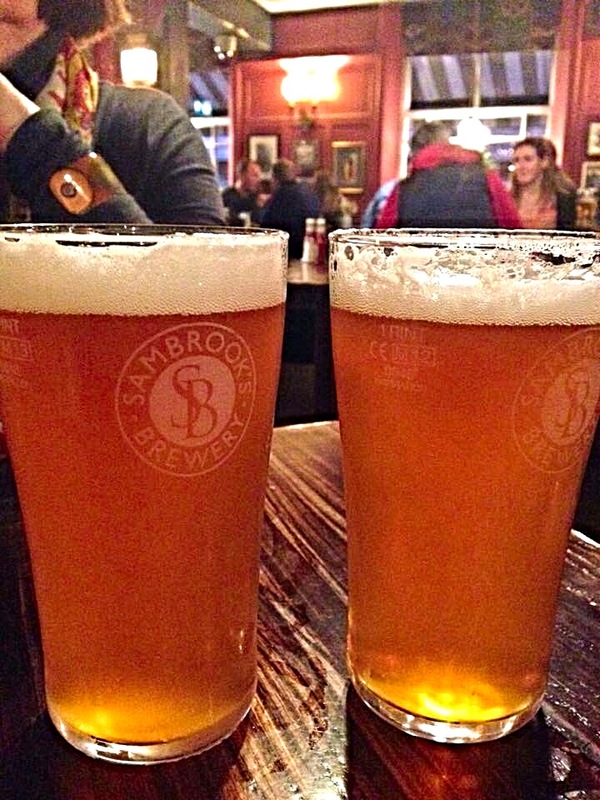 The Glassblower offers a nice selection of international bottled beers and an array of craft brews on tap. Butcombe’s Bitter and Shepherd Neame’s Whitstable Bay to name a few. 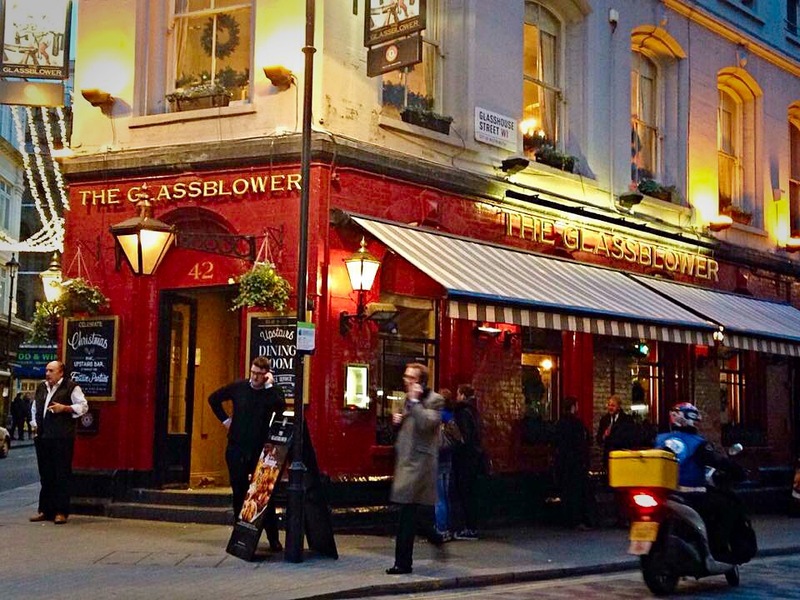 $$ Saving Tips: The Glassblower is a little pricey which is to be expected for Central London. I highly recommend sharing a platter. The portions are huge and we should have really split the Fish & Chips. Fish & Chips platters start at £12.69 which is approximately $19.50 going up from there and a pint of beer is £5.70/$9.00. Leave a comment Posted in England, London Tagged Butcombe's Bitter, Chicken Chardonnay Pancetta Pie, Le Meridien Piccadilly, London, Mushy Peas, Neame's Whitstable Bay, Piccadilly Circus, Pilkington Bros, Ploughman's Tart, Pub, Regent Street, Smashed Peas, The Glassblower, U.K.